Institutional investors’ behavior and preferences in Digital Assets have significantly changed over the past years. The overall trend shows an increase in total number of funds, a professionalization of product offers, and an enhanced ecosystem and infrastructure. Despite these developments, not a month goes by without an exchange being hacked. The result of which is funds being lost, stolen, or compromised, with no guarantee of recovery. Finally, some fund and asset managers have started to slowly move away from self-custody and/or pure cold storage towards more advanced solutions. Relying on self-custody not only equals to “buying internal risk”, but also presents a conflict of interest that could potentially raise regulatory concerns (i.e. by putting investors’ money at risk from not separating “operating” to ‘holding” the assets and distributing risks and responsibilities). On the other hand, cold storage, despite its perceived high security, remains a sub-optimal solution as it not only kills the Digital in Digital Assets, but also transfers the risk from high-security technological infrastructures to a human-managed process. The “offline” nature of cold-storage solutions prevents professional investors from taking advantage of market fluctuations. It keeps them away from participating in advanced Blockchain-protocol functionalities such as staking or harnessing the value of tokenized-securities. Deep-cold-storage in Swiss bunkers might sound secure — but are we talking digital here? A professional, sophisticated, and trusted Custody solution is the crucial missing piece of infrastructure holding back the growth of institutional investors in the space. We at Finoa believe in a future where assets will be natively digital, tokenized, and represented on the Blockchain. According to the World Economic Forum, $24 trillion worth of Digital Assets are projected to be stored and transacted on the Blockchain by 2027. Our mission is to provide asset services to those institutional investors that share our same vision, starting with a high-security, banking-grade, high-speed custody solution safeguarding Digital Assets. Finoa’s solution has been tailored to institutional investors’ needs, operating a secure and cost-effective infrastructure to service professional investors directly or as sub-custodian on behalf of financial institutions. Our warm-custody solution (online-storage with deep-cold-storage security characteristics) is based on state-of-the-art banking standards. Our infrastructure not only guarantees maximum security, but also unlocks the potential behind immediate-online-accessibility of Digital Assets — such as supporting in-custody trading, staking, voting, and other advanced Blockchain-protocol functionalities (currently in development). 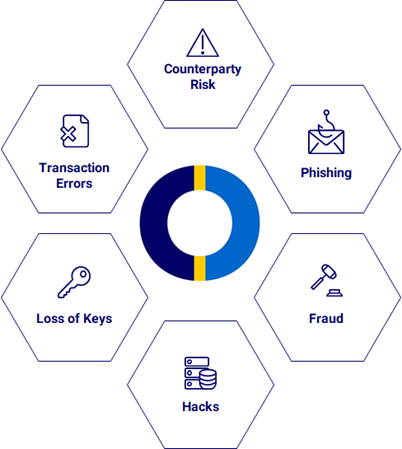 Compliant with European Union’s PSD2 banking regulation and built on EBICS (Electronic Banking Internet Communication Standard) standard, our custody solution removes common issues with Digital Assets and provides a frictionless experience for asset safeguarding and servicing. 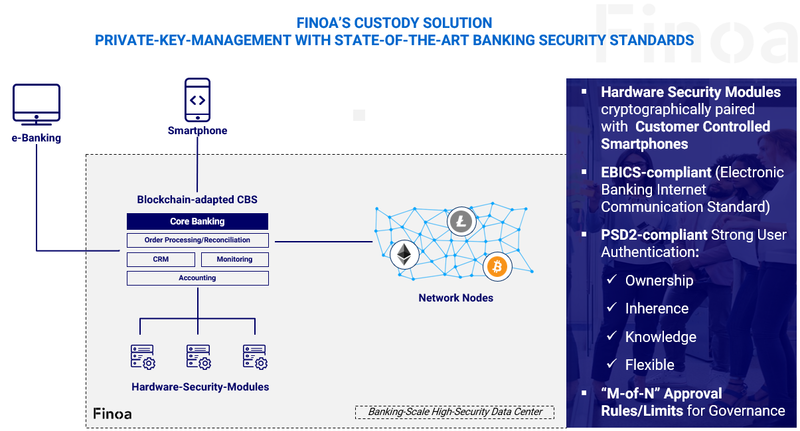 Developed on proven banking technology, Finoa guarantees maximum security and compliance by combining a custom-built core banking system, an eBanking interface, and a proprietary Blockchain/private-key-technology. Uniquely Regulated: License and Insurance Partners. Establishing redundant infrastructure plus backup-mechanism in banking-scale high-security data center. The importance of sophisticated and secure applications is paramount in Digital Asset Custody. With Finoa, we can provide the safety and security while delivering maximum user-friendliness and a digitally-native experience. Finoa is a German-based Startup, founded by a team of banking technology and cyber security experts, FinTech-entrepreneurs, financial services professional and former strategy consultants. The initial product of Digital Assets custody will serve as the base to grow the product portfolio in the future with more Digital Assets financial services such as Prime Brokerage, Tokenization Services, and/or Investment Services/Wealth Management. Get in touch with us to learn more about our solution (hello@finoa.io). We will be happy to demonstrate our capabilities and our distinctiveness.